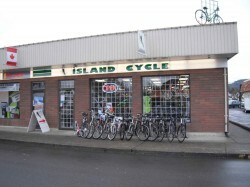 You get a full range of parts, friendly expert service and repairs for all makes & brands of bicycles. Check out our trails page! You will find mountain bike trails and bike routes for BC for you to ride whether on Vancouver Island or elsewhere in BC. If you are looking for cycling events you will find many local events listed as well as calendars from Cycling BC (which has mountain, road, and touring events), Nanaimo BMX, Langley BMX, and triathlons from TriBC. You will find up-to-the-minute cycling news on our news page which give you the latest news from Velo, Canadian Cyclist, and Slam. The BMXer will find race schedules, BMX bikes from Redline, WTP, MacNeil, and FreeAgent as well as accessories for your BMX bike.